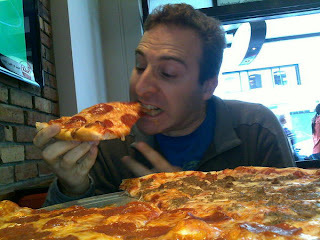 We did a quick Google search for 'best pizza auckland' today to find somewhere for a late and leisurely lunch. We had 3 results, the first 2 of which weren't open until 5pm on a Sunday. Sals Authentic New York Pizza however opened at 2pm, which gave us time to get into town, find a carpark and be there just on opening. Let me just say for a start, we were both really surprised to have never heard of Sals before - they're on Twitter, they have a fairly active Facebook presence, and from all accounts, they seem to be a bit of 'go to' spot - reminded me a little of Giapo's culture (although no-one does 'creating a place' as well as Giapo!). I'd love to see Sals and Giapo next door to each other, it would be quite something! Anyways, for a first visit we decided to order a full size pizza rather than choose slices to have reheated from the cabinet. Little did we realise just how enormous an 18" pizza is! (We brought slices home). We c hose a half-and-half - pepperoni for one half, meatball for the other. It took about 15 minutes and was served on top of a stand (like a cake stand, but for pizza) - Simon has seen this before in the US, but it was a new experience for me. They had jars of parmesan, herb & chilli flakes available to help yourself to as well. The pizza was great. Simple, tasty, and did I mention enormous? The experience was a hit for both of us as well - the place was already full bar one booth when we arrived (2 minutes after opening time) and there was a constant stream of customers the whole time we were there, plus we saw one delivery go out as well. I love the passion that Sals is clearly executed with - they import their mozarrella and tomato, they have a secret recipe pizza dough, minimal pizza flavour choices and just one size pizza (which of course you can also buy by the slice). Plus they do 2 specialty products - garlic knots (which we bought and enjoyed) and pepperoni wheels. And they deliver on Segways. Love it! We will definitely return - although to be fair, we don't often have pizza, but next time we have a hankering for it, Sals will be high on the list of options. We will absolutely be recommending them to others. And I've already 'liked' their Facebook page. Give them a go, I'm confident you too will plan to return!